Retired Computer Design Engineer. Main hobby photography. Moved to live in York in November 2010 to be near family. The 2018 York Walls Festival was a great success. Details of the August event have been published as a Special e-Newsletter. This has now been converted into a PDF file – and formatted to print as an 8-page booklet. The text is identical to the e-News, except for an added list of contributors (on the back page), and had to drop two pictures. You are free to use it as you wish. If an “archaeological dig” takes palace within FPT, as part of installing an electricity cable, then additional open day(s) may be arranged. Watch this space ! The tower will then normally be closed from the end of October 2018 until the York Residents Weekend at the end of January 2019. 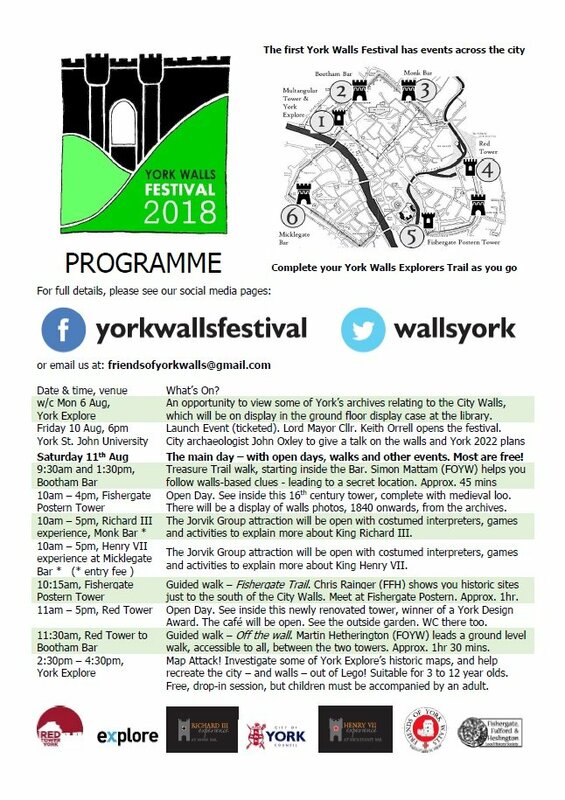 Community groups across York are working together to stage the first ever York Walls Festival, on Friday 10th and Saturday 11th August, 2018. Volunteers from the Red Tower group and Friends of York Walls, supported by Jorvik and City of York Council, are looking forward to celebrating and promoting this much-loved attraction. 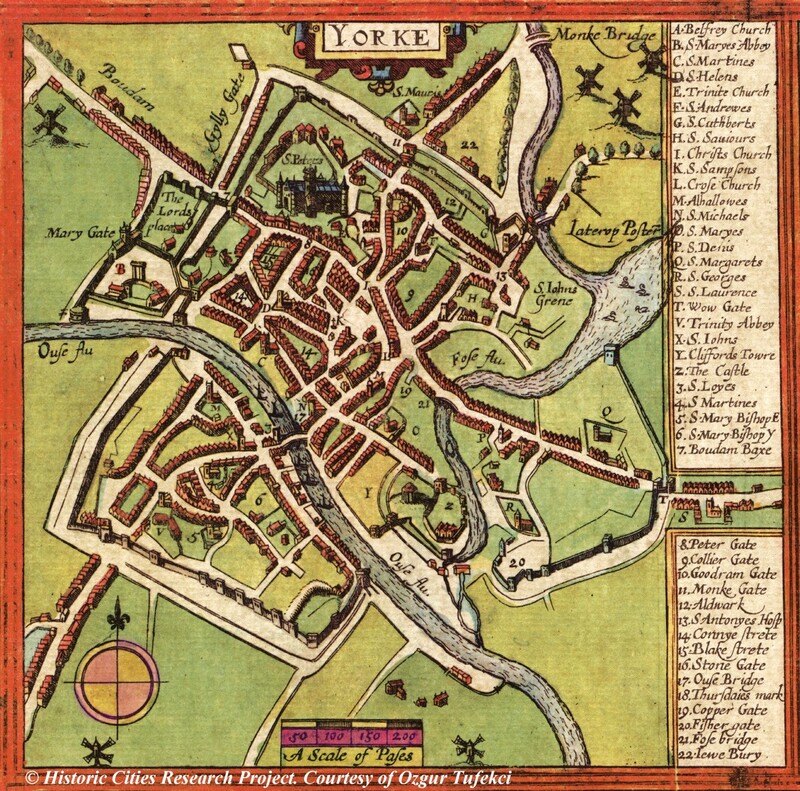 The launch event on the Friday evening, likely to be held at York St. John University will feature a talk by John Oxley, City Archaeologist, and a visit from the Lord Mayor of York. 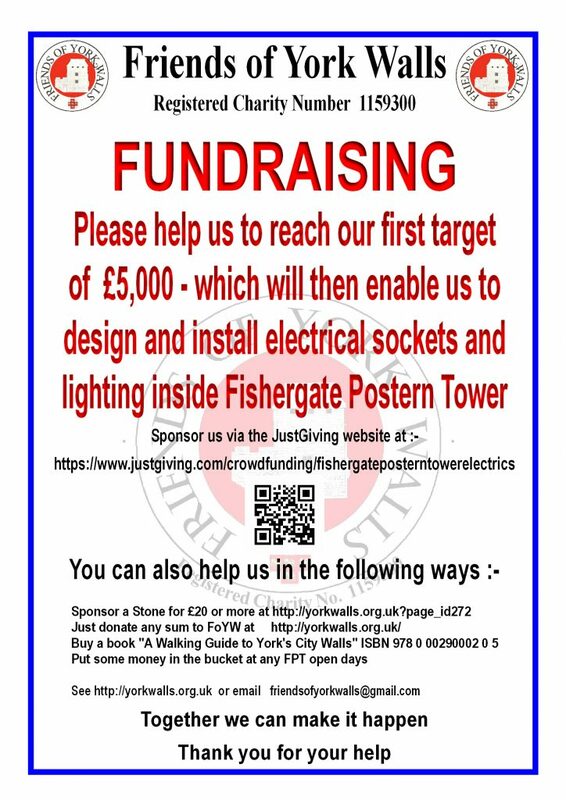 Please help The Friends of York Walls to pay for the installation of electrical sockets and new lighting inside Fishergate Postern Tower, a part of York’s famous City Walls. Please donate anything, however small, via the Justgiving Link Here and help us to improve the facilities inside the tower. Thank you! The Friends of York Walls have recently leased the tower from the City of York Council; and display information there about the tower and the history of York’s City Walls. Entry to the tower is free on our open days, but individual visits can be arranged for a donation. Currently we need money for internal electrical installations, lighting, and roof repairs. With electricity and lighting inside the tower we can then improve our informative and historical displays and enhance the visitor experience. 2018 Season – Here we come ! ! The next FPT “open day” of our new 2018 season will be at the “York Viking Festival Weekend” on Saturday 17th February. The tower is FREE ENTRY to everyone – although a small donation would be welcome ! “FOYW Map & Open Days Guide 2018” is now available. at the end of Piccadilly, is a 4 storey stone tower built around 1504 and has a quirky narrow spiral staircase linking the interesting rooms and with views of the roof structure. The FPT openings will be staffed by Friends of York Walls volunteers who will be on hand to help, and to tell you about the history of the tower. You can also learn about plans for the future of the tower and other 2018 planned activities. Copies of the FoYW book “A Walking Guide to York’s City Walls” will be on sale. You can also “Sponsor a Stone” on either the West Wall or the North Wall to raise funds for the restoration of and repairs to the tower.